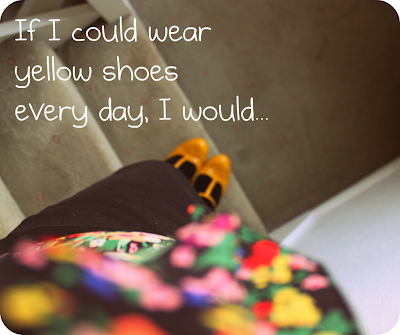 Yellow shoes make everything better. Fact. Particularly Mondays back at work after a weekend so good it made my face ache from all the smiling. In other news, I've decided to stop hiding and I've put a link to my weight loss blog over there in that there sidebar. Read it, don't read it, it's your call. I just thought now was as good a time for honesty as any. And I don't feel the need to hide parts of me any longer. I guess I'm not ashamed anymore.